If you live in the Toronto or a neighboring Canadian city like we do, you know tough windows are a must. How are your windows faring in keeping out the Northern cold? Were you cool and comfortable last summer when you needed the air conditioning the most? Making the decision to replace even one window is a significant one; it isn’t cheap! In fact, the average household avoids any type of significant home feature replacement until absolutely necessary. So, when is a Toronto home window replacement project a must? 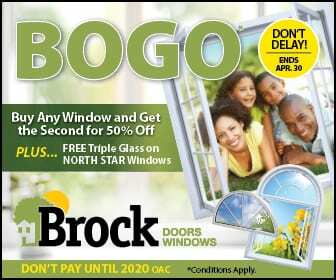 At Brock Doors and Windows, we never want our clients to spend money unnecessarily. There are too many important things in life we will all, inevitably, spend our hard-earned income on; unnecessary upgrades to your home should never be pushed on you. Sales pressure is not what our team here is about—we’re about you, your satisfaction, your most comfortable and secure home, and high-quality products. Age of window(s): Are your current windows still young enough to fall within their warranty? Or, have they approached/passed the 15-20 year mark? Thermal performance: Does the temperature stay consistent indoors while the world outside fluctuates? Visual pass: Do you notice any visual damage or changes to the frames? Warp? Chips? These signs may not necessarily indicate a need for replacement, but they do indicate maintenance or repair is needed (at very least) so as to avoid bigger problems. Climbing energy bills: Many homeowners miss this warning sign because it can be so gradual. Compare your current energy bill to the same month last year—are they similar? If some of these indicators ring true at your house, we want to help. When and if it’s time to replace—purchase quality products from a reputable company to ensure you get many, many years out of your windows. Cleaning: research (or ask our team!) what specific cleaning regimen is necessary for your window panes—not all materials require the same thing (i.e. : vinyl and aluminum are practically maintenance-free). Sash lubrication: tracks should always be lubricated in accordance with manufacturer instructions. Check the “weep holes:” Some windows have drainage systems that must remain clear and open or they could cause water leakage inside your house. We hope this article helps you determine what your home needs. If you are still unsure that now is the right time to replace your current windows, give Brock Doors and Windows a call. Our team will not misguide you. We’ll be happy to meet with you for a free consultation or simply sit down with you in our showroom to discuss your questions and concerns. Give us a call!